Just another day in India, or so we thought, as we strolled past the vibrant market stalls near the harbour of Kanyakumari, at the Southern most tip of India. It was Richard who was keen to come here, he seems to like standing on the end of pieces of land, he says he feels a sense of achievement having reached the end or the beginning, depending on which direction you’re facing, of a piece of land. A bit like climbing to the top of a very tall building I suppose. As we weaved our way through the market there was a throng of people chattering, bartering, shouting and trying to attract our attention, to sell us all manner of wonderful things. Fabrics, spices, toys, sunglasses, fresh garlands of sweet-scented jasmine, colourful beads and a whole variety of wind chimes and hanging decorations made from shells fresh from the sea. 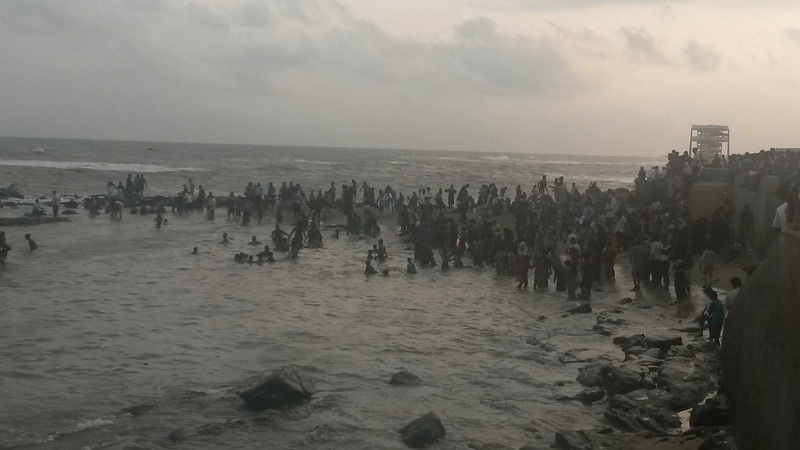 We walked to the sea front and saw a mass of people standing on the rocks and bathing in the sea all fully clothed! 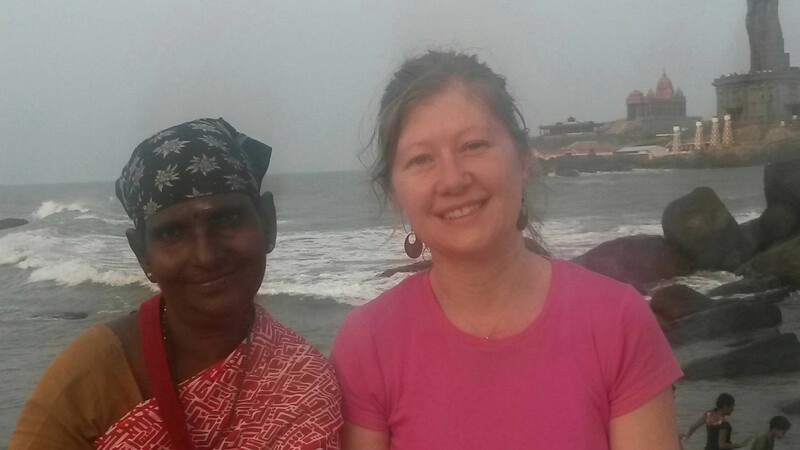 On our previous trip to India I was puzzled by the local people going into the sea in what looked to me, like their office clothes, shirts, trousers and sari’s for the women. This time I asked bystander why people weren’t wearing what I would consider appropriate beach wear, like swimming costumes or at least shorts and t-shirts. I was told that the women won’t wear swim suits in public places because they feel ashamed and would only wear them in private swimming pools. Fair enough but why the men wore their full clothes, seemed to have no explanation, ‘that’s just what we do’ I was told. We found a wall to sit on, to take in the view and soak up the atmosphere when we were approached by someone wielding a camera and they asked us if they could take our photo. We were a little puzzled at their request but happily obliged. First their daughters wanted their photo taken with us, then the mother and a whole host of other family members kept swapping in and out to have their photo taken with the Westerners. They seemed especially happy when we told them we were from London, UK! We thought this was very strange, but we shook hands and waved them goodbye. Seconds later, a group of men appeared, again requesting a photo. The man who approached us spoke good English so I asked him why he wanted to take our photo and he said ‘to make memories’. Maybe it wasn’t so strange after all, no more strange than us taking photo’s of people we meet on our travels, it’s just that we are usually the ones taking the pictures. His brother who wanted the photo was a government licensed opium farmer. He said if he even tried to sell one gram of opium outside of the official channels, this would land him in prison for 10yrs! So they took their photo’s and wandered on. We wondered if we could turn this into a business and began joke to the next person who wanted a photo that it would cost them 10 Rupees! Next in line for a photo was a street vendor called Gita who produced a handful of photo’s she had featured in, all with Westerners on their holidays. We eventually wandered on, feeling weary from all our ‘publicity shoots’ and wondering where on earth our pictures would end up! Hopefully not on any dodgy internet sites! Being the tourist attraction was a great way for us to meet and talk with new people but I think we prefer being the tourists!